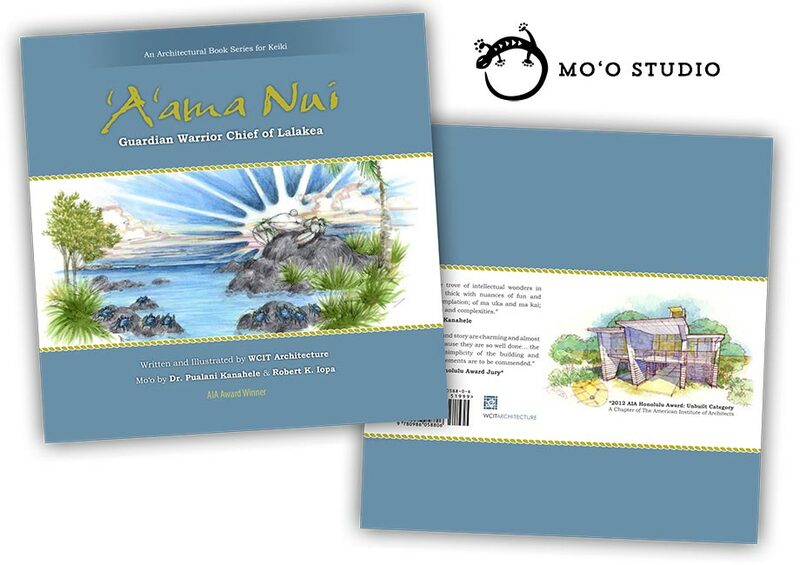 ‘A’ama Nui is the first book in a new architectural book series for children published by Mo’o Studios. ‘A’ama Nui is the tale of a legendary crab who protects the ponds of Lalakea. However, there is more to this tale…alongside the story of ‘A’ama Nui, the book’s author (WCIT Architecture) describes how the tale inspires the architectural design of an actual home – one that will reside along the shores of Lalakea, watching over it, like the legend of ‘A’ama Nui. Moʻo Studio celebrates the culture, stories and history of Hawaiʻi while inspiring and educating keiki about creativity, design, and architecture. Indeed influenced by the often playful and always protective nature of the moʻo (lizard), the name of the studio was chosen more to reflect a desire to engage in a deeper understanding of moʻo, particularly lineages. Moʻo Studio invokes our legacies of moʻokūʻauhau (genealogies), moʻolelo (stories), moʻokaʻi (journeys), and moʻowaiwai (valued practices) as a means to share stories of our beloved island home. Proceeds from ʻAʻama Nui will help support the Edith Kanakaʻole Foundation and the WCIT Foundation.